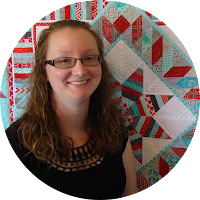 It's time for another Project Quilting challenge! The theme for this week's challenge is "well-dressed man." I had a unique way to interpret this one! 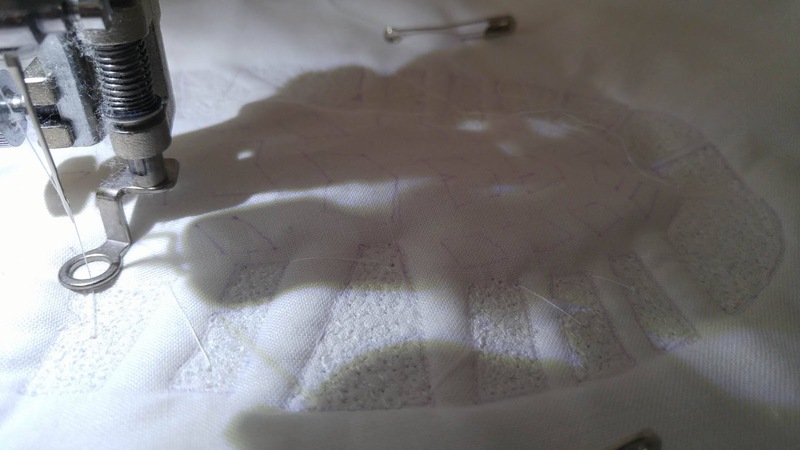 Project Quilting has its roots from the television show Project Runway. There's a theme posted on Sunday, and you have one week to make something based on that prompt. 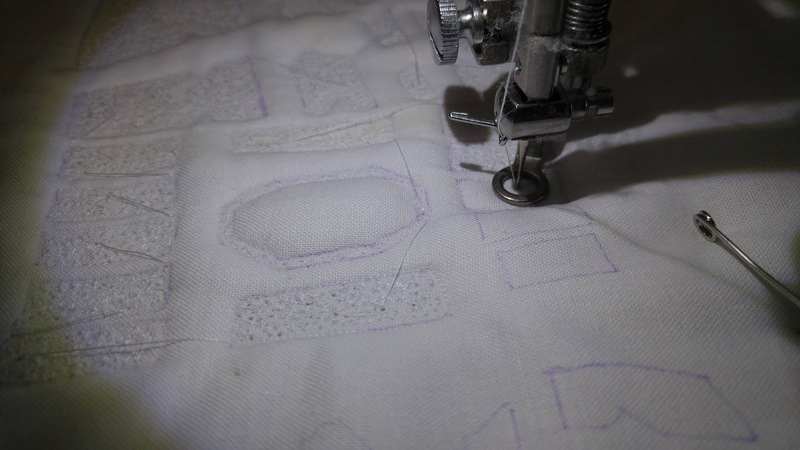 Your project has to have at least one of three things: include patchwork, include applique, and/or have three layers stitched together by hand or machine. This is the fifth challenge - there's only one more left until the end of the season! See my previous makes for this year here: Challenge 1, challenge 2, challenge 3, and challenge 4. 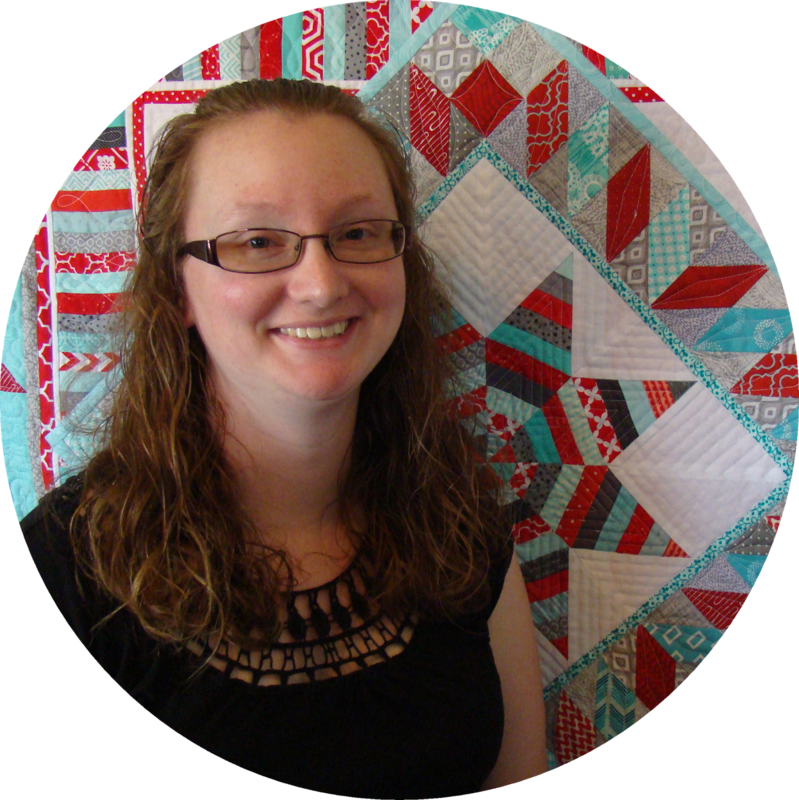 The challenge is really helping me get a good start to my "17 quilts in 2017" goal! I also feel like the challenge prompts are the start to a game of Chain Reaction (remember that gameshow??). The game gets you to go from one word to another using phrases or compound words. Here's an example that shows how to go from HALF to PLANT. So....for this challenge, I did a little chain reaction thinking to come up with my idea. My husband is an Air Force veteran, but has been out for over a decade. I decided to try and get a picture of a current boot. 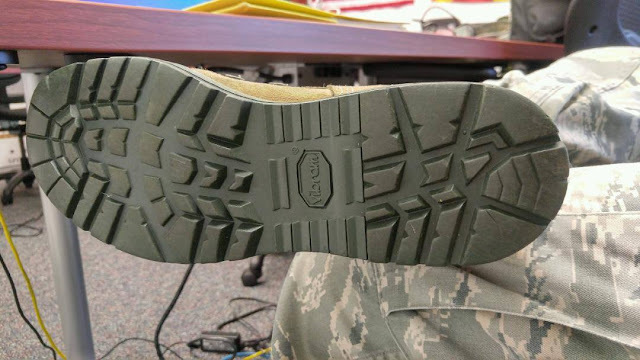 My friend's husband is in the Air Force and sent me a picture of his boot. 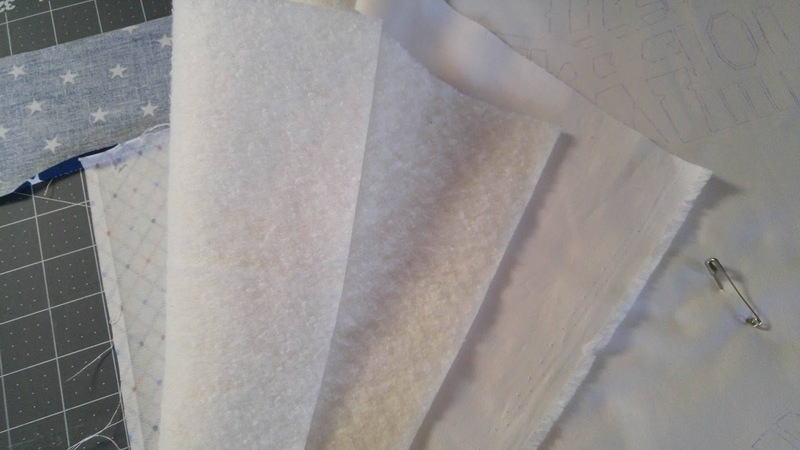 I originally thought about using tan fabric for the whole cloth quilt, but decided I wanted to go a more symbolic route, so I chose Kona white by Robert Kaufman fabrics. White symbolizes peace. 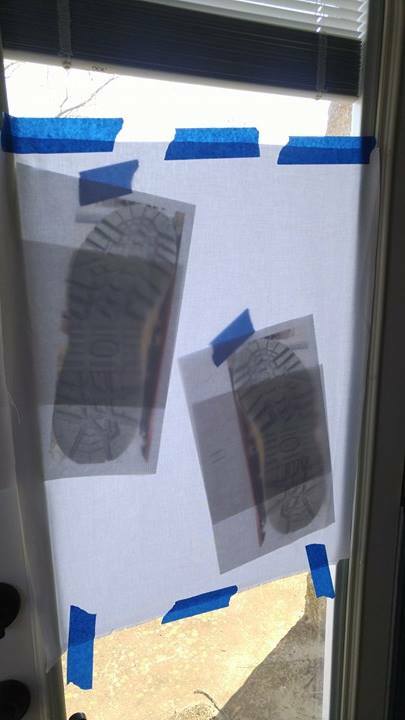 I printed the boot print lifesize in grayscale and taped it to a window. 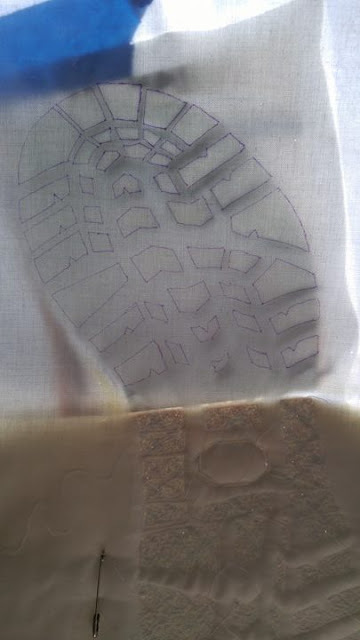 Then I taped my white fabric over the photo and used a disappearing ink pen to trace the boot prints. 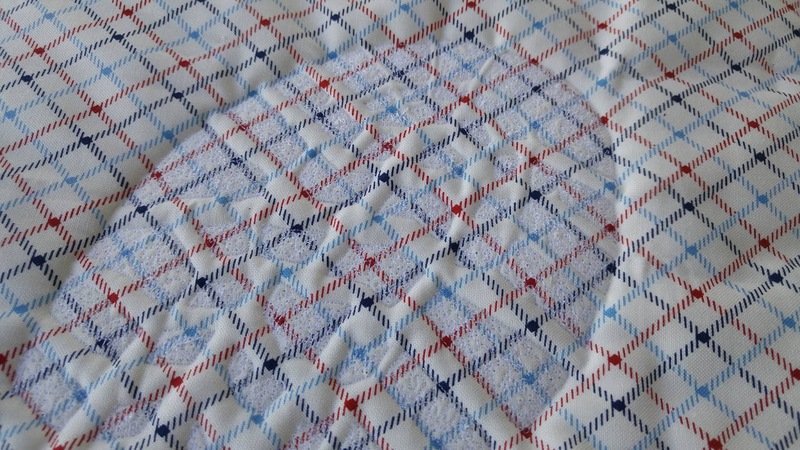 I made a quilt sandwich using two layers of cotton batting and a red, white, and blue fabric for the backing and pin basted the layers together. 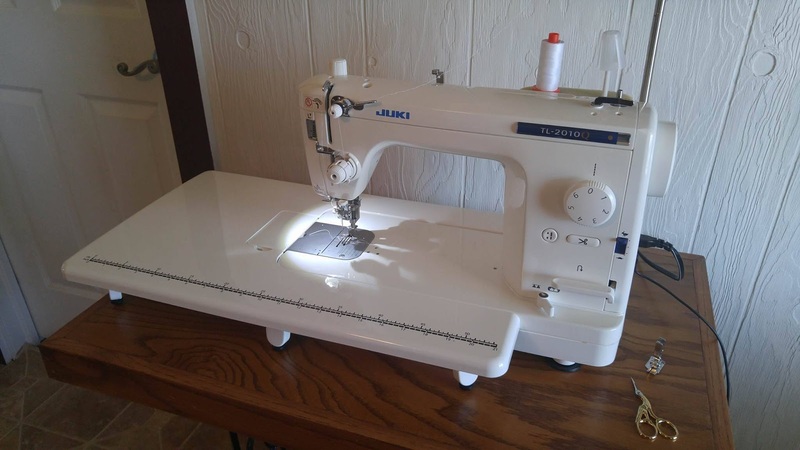 Before Christmas, I bought a Juki TL-2010Q sewing machine, but hadn't ever used it yet. This was the quilt to start! So this is the first quilt made with my new-to-me machine! 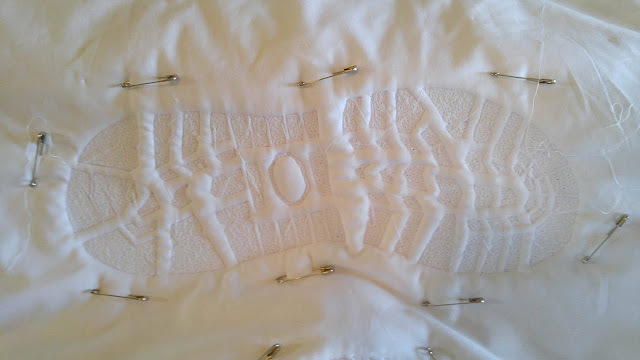 Using white Aurifil thread, I began by densely quilting the boot prints. 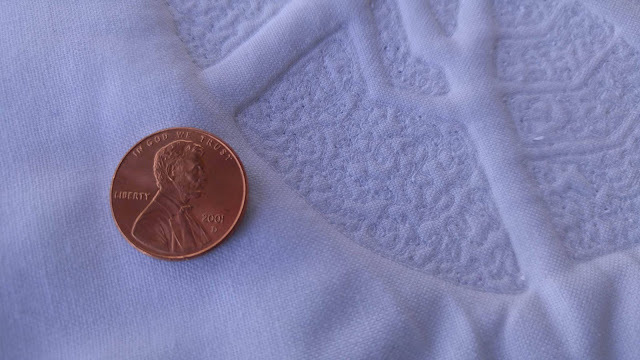 I used a micro stipple to create very dense quilting. Then I had to stop and make supper. After finishing up the dishes, I came back to this. The disappearing ink that claims it disappears in 2-10 days, disappeared completely in just 4 hours!! I had to sleep on it to calm down. 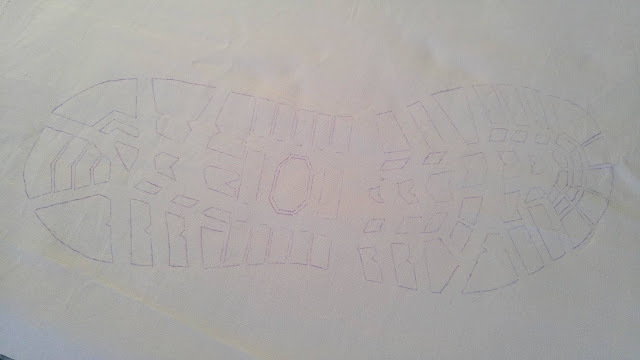 I decided to un-baste the quilt, and retrace the rest of the boot print (only one this time!). 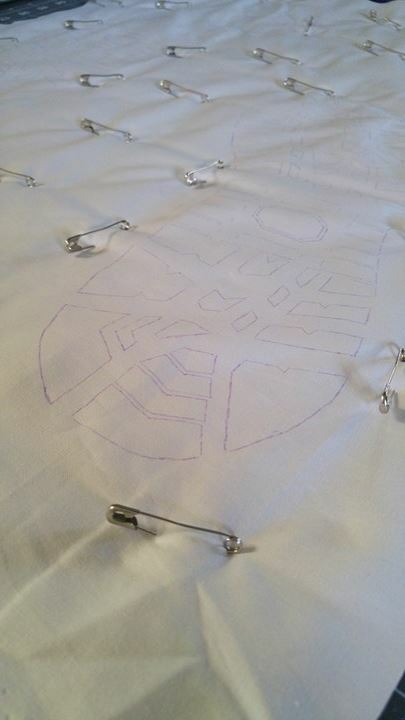 I finished up the quilting for that boot, then un-basted again to trace the second boot. 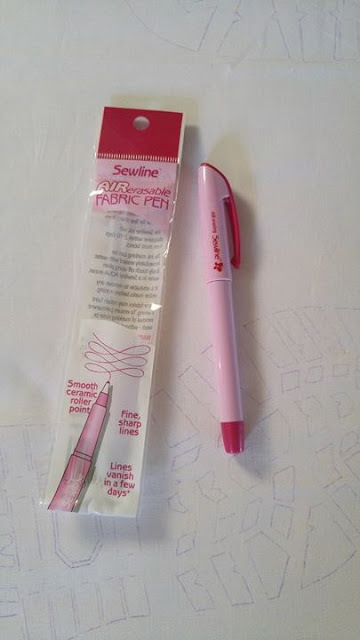 It was like a quilting race to finish before the ink disappeared! Crazy! I originally planned to quilt the background with pebbles to mimic the ground/sand, but after finishing the boots, decided adding anything else would just take away from the boot prints. 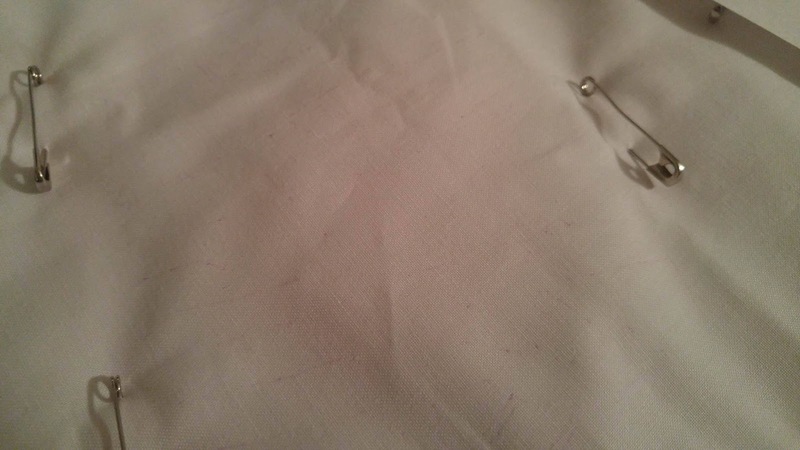 Once finished, I trimmed the quilt to 16" x 18" and bound it using more white fabric. 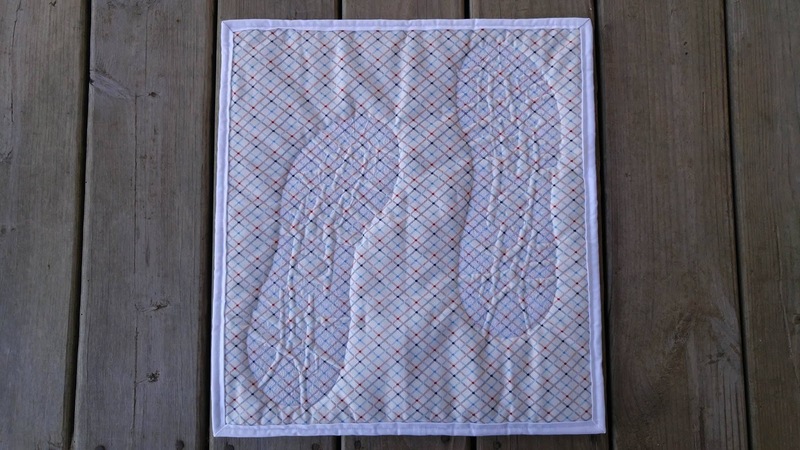 I wanted the quilting to be the star, and thought a colored binding would draw your eye away from that. 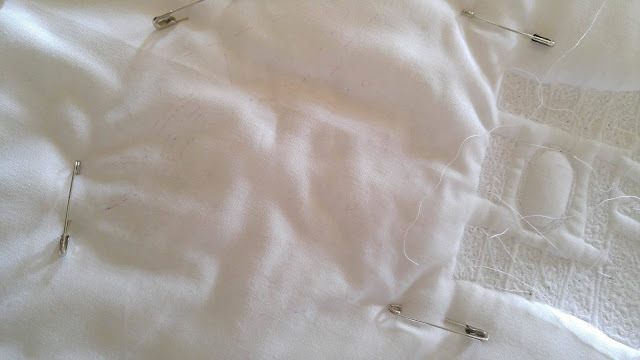 I tried many new things with this quilt - even a new sewing machine! 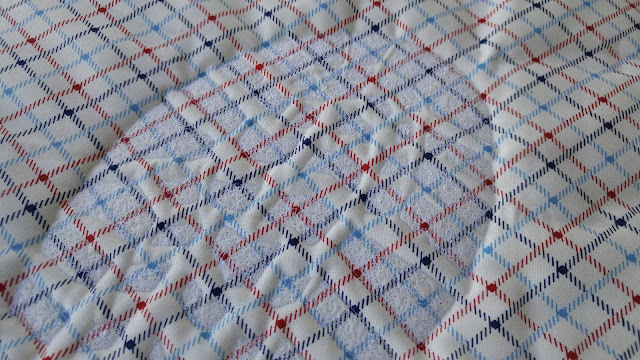 This is my first whole cloth quilt too. And just like every time I try new things, I learned a lot! I wanted the quilt to speak for itself. I wanted the viewer to be able to interpret it the way that most impacted them. 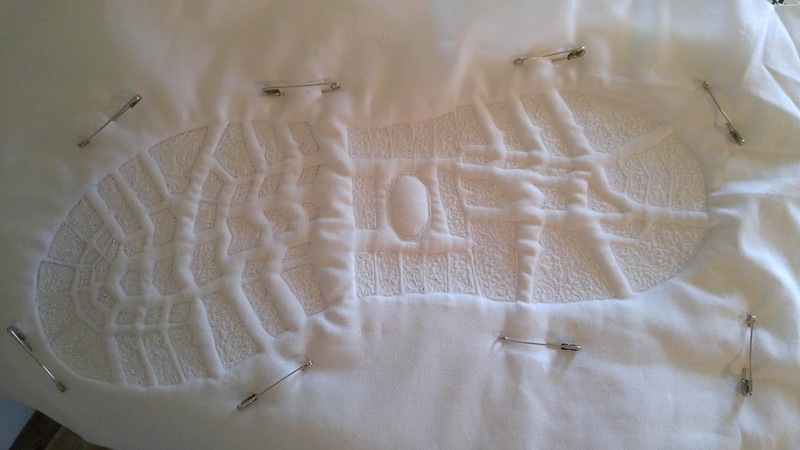 I have my own thoughts, but I hope that the quilt has meaning for you too. I wanted the left boot print to be farther forward to symbolize how military marching always begins with the left foot. Did you know that 6,868 6,875 men and women have given their life for America since 2001? One Three this year. (Sadly, the numbers change often. In the few days this blog post went from draft to published, the numbers changed. You can get an up to date count here.) 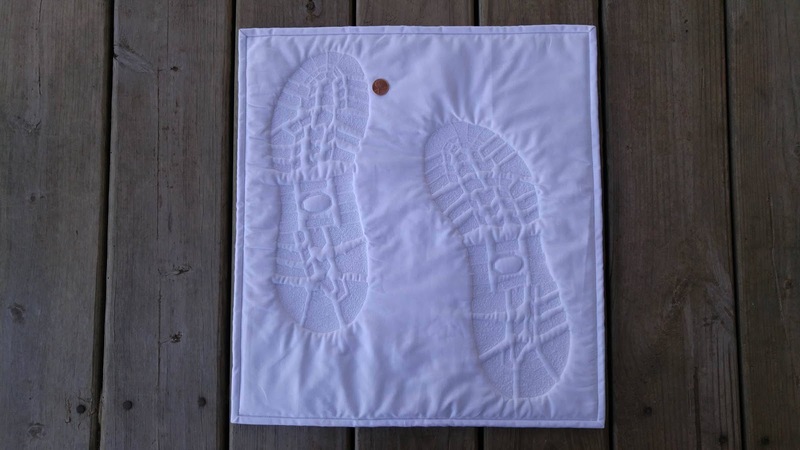 The footprints on the quilt represent the soldier(s) that left a mark, but is no longer with us. Even though we can't see the soldier, he/she has left a lasting impression. On us. For us. For America. 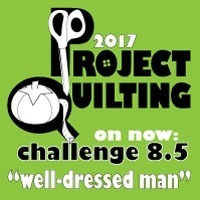 Head over to Persimon Dreams to see all the "well-dressed man" inspired quilts and vote for your favorites! Linking up to Persimon Dreams for ProjectQuilting Challenge 5, Thank Goodness It's Finished Friday at Celtic Thistle Stitches, Finish It Up Friday at Crazy Mom Quilts, Show Off Saturday at Sew Can She, Finished or Not Friday at Busy Hands Quilts, and Fabric Frenzy Friday at Fort Worth Fabric Studio. WOW!!! This is such an amazing idea and I just love how you achieved a boot print through dense quilting. And despite the disappearing ink woes...it looks like you and your new Juki are off to a great start!! I too have the same machine and absolutely love it!! I am so very impressed with this quilt. My cousin lost her son to PTSD. 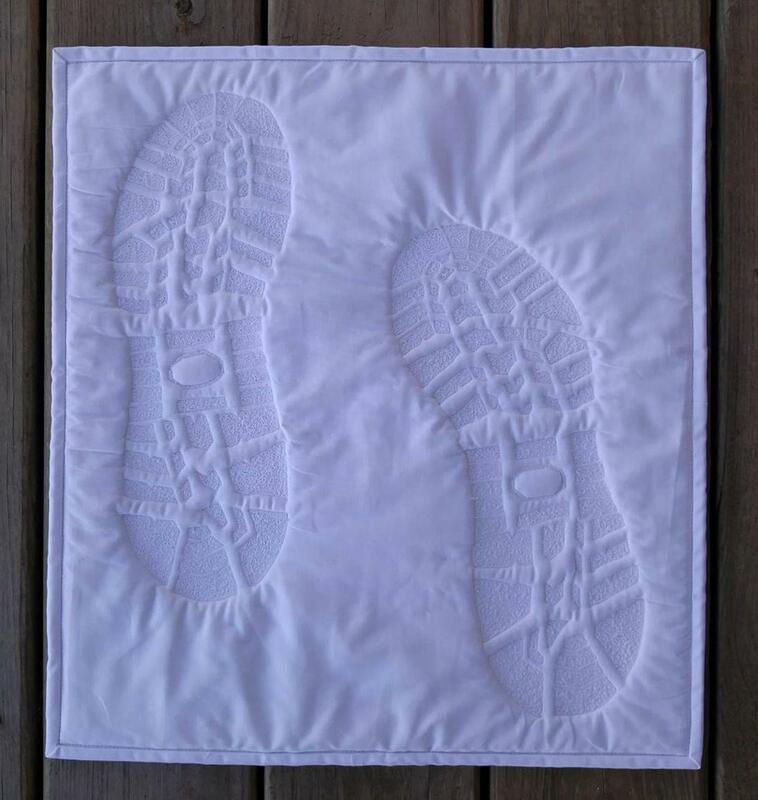 With your permission, I'd like to make her a quilt somewhat like this using his boots. I have a few ideas that might change the pattern a bit, but it's still your original idea and I would not consider without your permission. 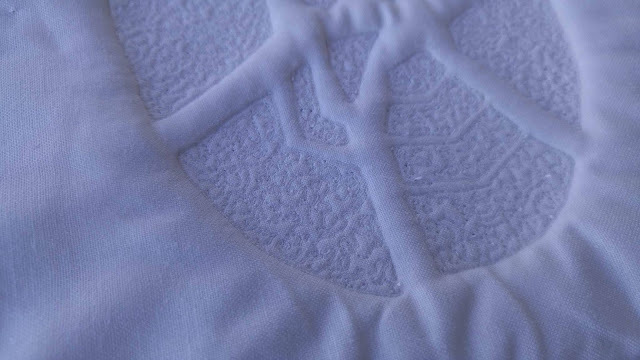 Either way, you should know that your quilt is stunning. This is very interesting. 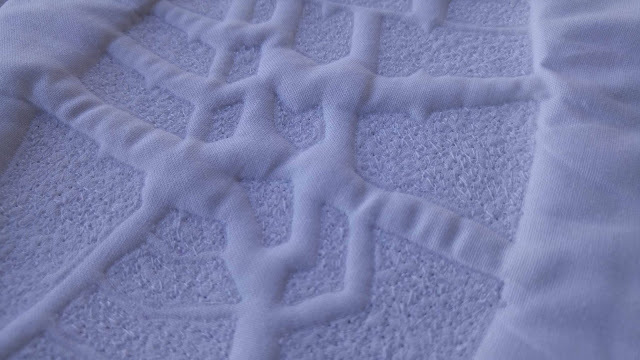 Quilting is fab and replicate beautiful foot print on snow so nicely. Love this. 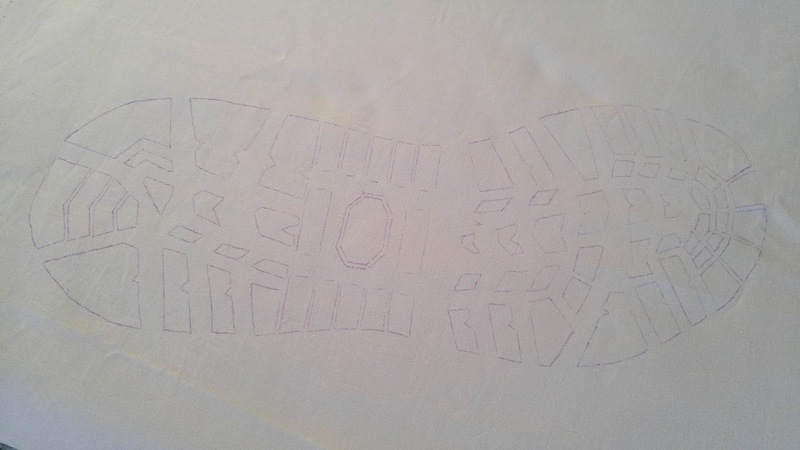 I did footprint outlining on a gift quilt using the treadmarks of my friend's favorite running shoes, but I didn't fill spaces in like you did here. I can well imagine the race to finish before you lost the markings! I'm all choked up reading this! My son is just returning to training after Boot Camp, he is a Marine. So this hits close to home for me. I love what you did! Thanks for sharing and leaving such an impression on me! Your quilt is very profound in the silence and respect. My son is in the Air Force and I am proud of his service. Please thank your husband for his service. This is excellent in message and execution! Thank you! This is absolutely incredible. What an impactful piece! I am so happy you stopped quilting when you did ... you were absolutely right - anything more would have taken away from the boots. This is amazing and so well thought out and done. What a great tribute to our men and woman that serve! I had to show my husband (retired after 30 years in the military). He was so impressed he went on and voted for your quilt. Thank you for showing us your process. This is amazing. 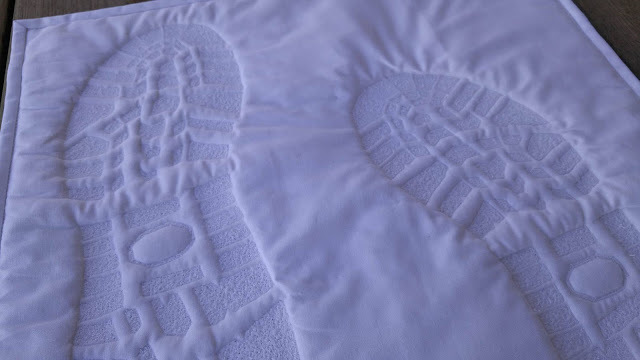 This is very impactful - the decision to have only the boot prints as the impression was spot on! About the disappearing ink - I had a similar situation where a friend wrote something onto fabric, then brought it to my house so I could embroider it. Unfortunately this ink disappears with heat, so after having it in the hot car for the morning, by the time she stopped by the house, her lines were gone! We didn't know that all she had to do was place the fabric in the freezer to reactivate the lines, but it made for a funny story anyway. You may want to try some different marking tools - like the blue ink, that disappears with water. 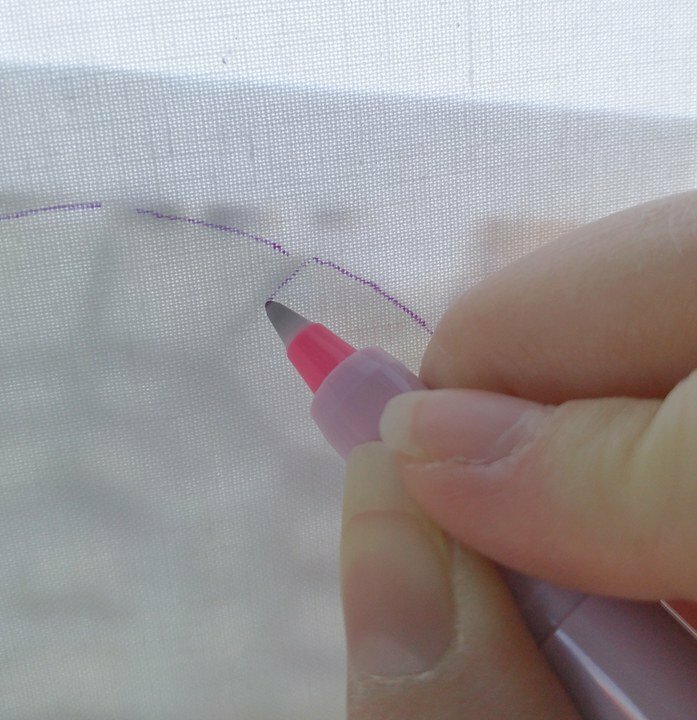 Personally, I just use a light pencil line, but I can see that would have detracted from this piece, which AGAIN, is amazing. Fantastic idea. Very well executed! I can not thank you enough for this idea..I could never make it because I can not stop crying. My family is military and watching my sister, two brothers, and husband go and hoping to hear from them has been very life changing for me. I love all the thought that you put into this quilt. I do not see how you could improve it...it is perfect. This is fantastic! Love what you did! Hi Laura - I am popping over from the 2017NQB group. What an amazing post to come across for the firs time here. This is just an amazing piece of work - stunning! An absolutely amazing quilt and a wonderful post on the process too. Too wonderful and meaningful for words. Thank you to your husband for his service to our country. I love what you've done and what it symbolizes. Well done. I love seeing your thought processes. 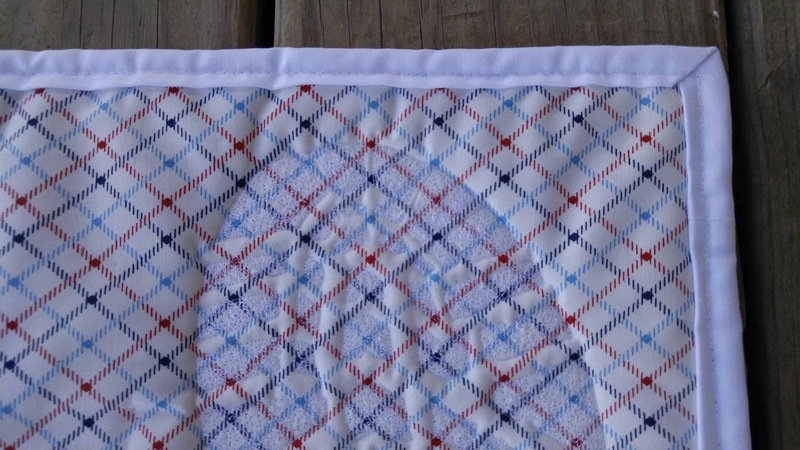 And such a wonderful mini quilt. WOW!! That is incredible!! It's so symbolic and not and beautiful and just a little of everything that means something. I'm am totally impressed!! !